If you're thinking "Where can I find affordable double glazing near me?" then contact Discount Windows & Conservatories today to discuss your requirements. With our extensive understanding of the double glazing products that we sell, we are able to expertly install your double glazing in Clacton-on-Sea and the surrounding area quickly and efficiently and within the specified deadline. You can rely on the quality of our designs to deliver fantastic value. The double glazing that we install will continue to offer you great value for money, making your home improvement a good investment for years to come. Our double glazing in Clacton-on-Sea and throughout the Tendring district are matched in equal measure by our low local prices, which means wherever you are in the Tendring area, you’ll be able to find quality double glazing near me. Whether you’re thinking about a home refurbishment project – or perhaps deciding whether you have the budget for a brand new orangery or conservatory. Whatever your aims might be, you’ll probably be thinking, I need to find a reliable double glazing installer near me. With industry experience spanning four decades, we’re the perfect choice. Discount Windows & Conservatories partners leading manufacturers to provide homeowners with an extensive choice of premium quality double glazing products. These range from windows including the beautiful Heritage Flush Sash windows from Deceuninck, to composite doors from Doorstop, to the latest solid conservatory roofs from Ultraframe. Can I Find Quality Double Glazing Near Me That Will Last? Homes in Clacton-on-Sea and throughout the Tendring district will vary in shape and size, however each will share a common trait: individuality. Whatever style of property that you own, whether a bungalow, a small terraced house, or a five-bed detached period property, your home will have its unique characteristics. With our vast knowledge of installing double glazing in Clacton-on-Sea and throughout the Tendring Peninsula, we’ll be able to find a design that suits your home perfectly. It’s hard to beat the authentic look of Timber. But what is an expensive options also requires continuous investment with regular maintenance needed to uphold their look and performance. If you’ve been looking for timber framed doors and windows, but have been put off by the cost, our uPVC doors and windows will provide you with an affordable solution. You’ll be able to customise your doors and windows using our palette of coloured and woodgrain foils. Perhaps you’re looking for more space or an extra room in your home but you don’t want to move house as the market prices are putting you off, why not consider building an orangery. You can achieve a truly modern look that’ll bring the outside inside and fill your home with plenty of natural light. Our range of beautiful bi-fold doors and roof lanterns – coupled together with a lower brick-to-glass ratio – will allow you to achieve your design aims without any problems. Maybe you’ve been thinking to yourself “Where can I buy secure double glazing near me to protect my home in Clacton?”. Well, look no further than Discount Windows & Conservatories. Security is an important concern for any homeowner when choosing double glazing. You need hinges and locking mechanisms that you can be confident will rebuff any potential intruders – but without having to pay excessive costs for the privilege. All of our doors and windows that we install are cost-efficient and will keep you, your family and your home safe and secure. Can I Buy Double Glazing Near Me That’s Energy Efficient? Achieving a high energy rating for your home in Clacton or the surrounding area is essential for many homeowner for many reasons. Otherwise, you’ll have new windows and doors that look nice but have no practical value. Our range of uPVC windows and doors are able to achieve levels of thermal insulation that will – if opting for triple glazing – enable you to achieve an exceptional A*25 rating for your home or extension. Our customers are rightfully keen to buy environmentally friendly double glazing that’s energy efficient. The doors and windows that we sell aren’t just energy-efficient – resulting in achieving lower a carbon footprint – they’re also entirely recyclable and can be fully-customisable to align perfectly with your design requirements, no matter what they may be. We pride ourselves on our reputation. 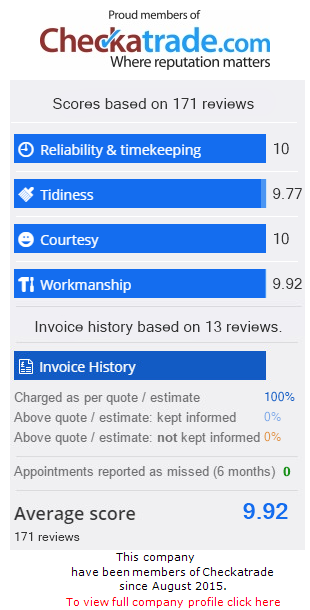 As Checkatrade members, we promise a service that has been vetted and approved by a prestigious, independent governing body. See our excellent ratings for yourself to find out why we’re so highly thought of in the Clacton-on-Sea area! Are you looking for “accredited double glazing installers near me”? The double glazing that we install for you needs to be designed to align with your design specifications. Our technical knowledge allows us to measure accurately to ensure that we provide you the perfect fit for your home. Whether choosing the right materials or taking the right measurements, through to selecting hardware options and an appropriate colour scheme, we’ll consult with you to make sure your home improvement project compliments your home. Equally, our customer service is completely built around you. That’s why we’ll always do our best to anticipate your questions by proactively contacting you at key points throughout every step of the project. If you have a technical question – or need to ask us anything else about your double glazing products – we’ll be fully contactable and will reply to your query as a matter of urgency. Whether you need replacement uPVC casement windows, a new composite door or solid conservatory roof, our expert team will provide you with a cost-effective design solution. Due to our precision in surveying, measuring and installing your home improvements, you can be sure that you’ll enjoy long lasting functionality and a beautiful appearance. And because our double glazing products are backed by 10-year manufacturer guarantees, you’ll be able to enjoy them for many more years to come. Are you looking for quotes for affordable double glazing near me, you are welcome to use our simple to use design tool. Just select your windows, doors, conservatory or other double glazing product and you will receive a tailored price that is specific to you and locally competitive – you can try it as many time as you like. If you need some help or want to ask us a question, or would prefer to talk to an experienced member of our team in person, please get in contact with us via our contact form and we’ll get back to you soon.